Back in April we covered Instadesk, the first Instagram client for Mac that, through an interface design similar to iTunes and iPhoto, allowed you to browse Instagram photos, users, likes and comments directly from your desktop. The app was one of the thousands of results coming from the launch of the Instagram API, a set of tools that enable third-party developers to plug into your Instagram feed to retrieve photos uploaded by you or relevant to you. Of all the Instagram-connected apps we've covered, Instadesk saw a huge success as it was the first one to land on the Mac App Store. Carousel, however, wants to step the game up by offering a beautiful and slick way to access Instagram from your Mac with a design that's heavily inspired by iOS, yet runs natively on OS X. I don't know if the developers are using the Iconfactory's Chameleon framework for this, but it certainly looks like Carousel has some similarities with Twitterrific -- the Twitter client from the Iconfactory that shares it codebase across the Mac, iPhone and iPad. So what's this all about? First off, Carousel presents a minimal, vertical-oriented interface as if you were looking at your iPhone's screen in portrait mode while browsing Instagram. 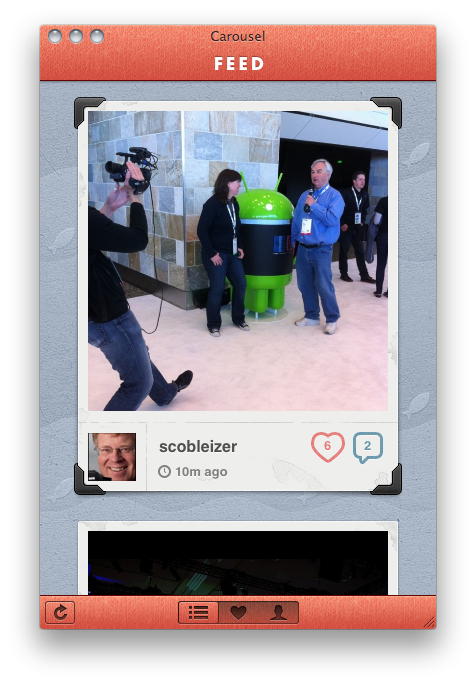 The photo stream is embedded directly into the app's window, with beautiful Instagram photos to flick through as they load. 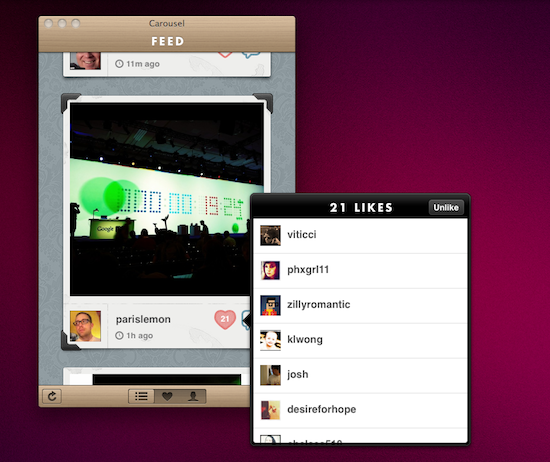 At the bottom, three tabs allow you to switch between your feed, popular photos and your profile. Every photo can be enlarged via Quick Look, saved locally on your Mac, or commented / liked thanks to a wide selection of keyboard shortcuts to choose from. 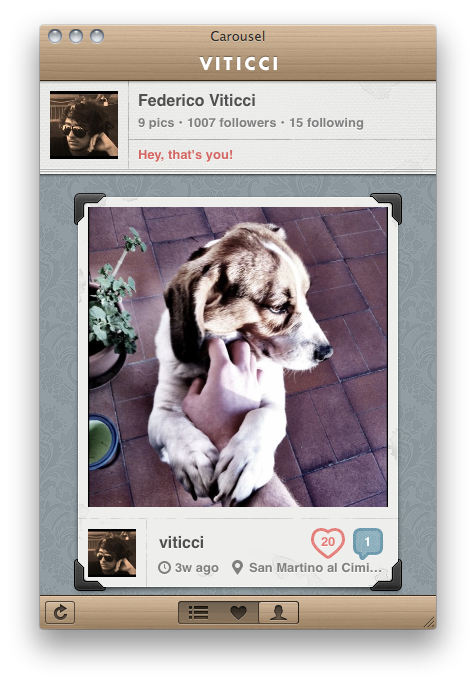 In Carousel, you can open every user's profile to check out their photos. You can comment and like pictures, too, with interaction happening inside an iOS-like popover that resembles Twitterrific's implementation of conversation views and profiles. You can even view if a user's following you, or if you're following him. Last, the app can be themed. Carousel's default theme is already gorgeous in my opinion, but you can switch to a classic Mac or red one from the Settings. Carousel can be downloaded for free, or you can purchase a license at $4.99 (introductory price) from the developer's website. More screenshots below.